Our silicone sealing gaskets for cabinets and enclosures offer fire protection to DIN EN 45545-2 and other national/international standards from NF, UNI, ASTM and SMP. They are suitable for road and rail hazard level applications and for high temperature environments for the protection against ingress of dust and water. Sealing strips in the program series 1011, 1003 and 1016 come in extruded forms including P section and lip seal clip-on types, as well as push-in rectangular sections. Material is foam or solid. Silicone versions are in grey sold material – EPDM versions are in black foam. 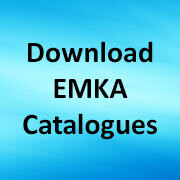 CAD drawings of moulded sealing strips are available for download from www.emka.com/uk_en/products/cad-files/. Share the post "Fire protection silicone gaskets"